Shopify merchants from all around the globe are turning their gaze towards Brazil. The reason for that is because the platform has seen an impressive growth in Latin America. Now, more than ever, shoppers in the region are resorting to cross-border ecommerce to fulfill their shopping needs. Brazilian shoppers are after better prices, more variety, product availability and a better selection of items. However, there are a few things that web entrepreneurs should be aware of when marketing towards Brazilians, and it all comes down to local payment methods. The last time Shopify released a report with their merchant’s demographic breakdown, roughly a year ago, Latin America was the absolute leader in merchant growth, with an astounding 168% increase. Asia came in second, with 82%, followed by Africa, with 70%, and North America, with 56%. Consumers today have unending access to online shops. They will choose to buy from the shops who offer the best buying experience. It’s a known fact that familiarity brings comfort, and there are different ways to engage with international visitors who land on your page looking for a product. Currency conversion and page translation apps are great ways of driving international traffic to a shop. However, the biggest challenge that merchants face is having people finalize their purchases. It all comes down to local payment methods. Offering local payment methods is a solution to successfully convert the traffic that’s being driven from Brazil on ecommerce stores into sales. Doing so, merchants will be able to meet the needs of all Brazilian online shoppers. Only a smart part of Brazilians own credit cards that are enabled for international purchases. The rest of them rely entirely on local payment methods, such as domestic credit cards, bank transfers and the boleto. Breaking the local payment barrier is like breaking a language barrier. Once business owners get a grasp of how Brazilians are used to paying for their online purchases, and how easy it is to come up with a solution, business will most certainly thrive. A few years ago, cross-border ecommerce stores would need to open a company in Brazil to deal with all the bureaucracy involved with local payment methods to receive their money from Brazilian customers. Today, there is no need for such hassles. Local payment partners, such as EBANX, offer these services. This gives global sellers an easy access to the Brazilian and Latin American consumer markets. Other advantages of offering local payment methods are an increased credibility, a reducement in cart abandonment and an improvement in sales. It’s a form of staying relevant in the eyes of your customers and reaching even more buyers. The Boleto bancário is a printable document or a virtual (PDF or image) voucher, used to complete an array of purchases in Brazil. It’s the preferred cash payment method in the country. These documents are regulated by the Brazilian Federation of Banks (FEBRABAN). They allow millions of Brazilian consumers to pay their bills in more than 40K different boleto processing locations around the country. Boletos carry highly detailed information. They come with a barcode, a corresponding serial number, transaction amount, issuing bank code, customer information, description, and expiration date. There are two-way customers can pay for their boletos. The fastest way is without stepping away from their devices, using an internet banking app. All they have to do is scan the barcode or type in the serial number. This method charges the amount directly from the customer’s available balance. The old-fashioned way is to print the voucher and take it to one of the many different places that process them. There is one in virtually every corner in Brazil. These places are Lotércias (lottery houses), gas stations, supermarkets, banks and post offices. Merchants can choose the expiration dates on boletos. Depending on that, it can take the customer anywhere from 3 to 15 days to complete the transaction. In case the customer chooses to pay after the expiration date, they will either be charged a late fee or the transaction won’t be processed at all. It takes up to 3 days for the bank to confirm the payment. That’s when the money is sent to the merchant’s account. And since the boleto it’s a cash payment method, there is no chargeback and no fraud risk. Most people in Brazil don’t own international credit cards, but 66% of the population are owners of domestic ones. Brands such as Elo and Hipercard are Brazilian natives that can only process transactions in Brazilian Real (BRL). Banks usually issue them to account holders instead of international credit cards because they are less likely to suffer fraudulent transactions. The limits on these cards are relatively low, which is why so many applications are approved. However, their Brazilian owners are unable to make ecommerce purchases using them. Shopify merchants who are concerned about low approval rates in Brazil should make no mistake: the country is a valuable market. Which is why accepting Brazilian credit cards on ecommerce stores is a smart move. Approval rates can double by doing so. The best solution is to ally with a partner that also accepts local credit cards as a payment option. A good payment gateway in Brazil can make transactions with domestic credit cards in international websites through local acquiring. While we’re at it, let’s talk about installments. Brazilians are used to paying for their purchases in installments with their credit cards. Installments are a payment plan applied on a purchase. Rather than paying outright, Brazilians have a strong preference to pay for a purchase in parcels spread throughout the year. This works with both domestic and international credit cards. The reason why installments are so popular is that people in Brazil feel that they are a form of acquiring a product without feeling the direct impact of a purchase in their budget. 79% of Brazilians are used to paying in installments, and the average of parcels per purchase is 6. 30% of Brazilian buyers don’t finish a purchase if a store doesn’t offer the payment method. This practice is different from splitting the credit card bill. Merchants who offer installments are paid upfront by the credit card companies, which are responsible for charging the users for the parcels in the upcoming months. The higher the amount spent on a single purchase, the more installments can be made available for clients to split the bill evenly. Installments are very common in Brazil, in both online and brick-and-mortar businesses. TEF is a form of online payment. Brazilians who are used to Internet Banking systems are already aware that electronic transfers are a fast and practical way of making transactions. TEF gives buyers the option of paying instantly without having to worry about paperwork or bills. It is mainly used for transfers through debit and credit cards, but many banks use the TEF to move funds between accounts from the same bank. If you can opt for having TEF in your payment method options, you most definitely should. It is usually cheaper, and sometimes even for free. TEF works with the help of an integration partner. When the buyer opts for this method, they are redirected to the Internet Banking page of their own bank and are able to perform the entire transaction there. The downsides of this method are the need for the consumer to have Internet Banking enabled on their device and the possible limitation of values by the bank. How Can Global Stores Accept Brazilian Payment Methods on Shopify? There are two ways to offer those local payment methods to your customers: the hard way, and the easy way. The hard way – opening a local entity: the process of opening a local branch includes submitting a request to the government, registering at the board of trade, and sending foreign capital through an authorized Brazilian institution, among other formal requirements. 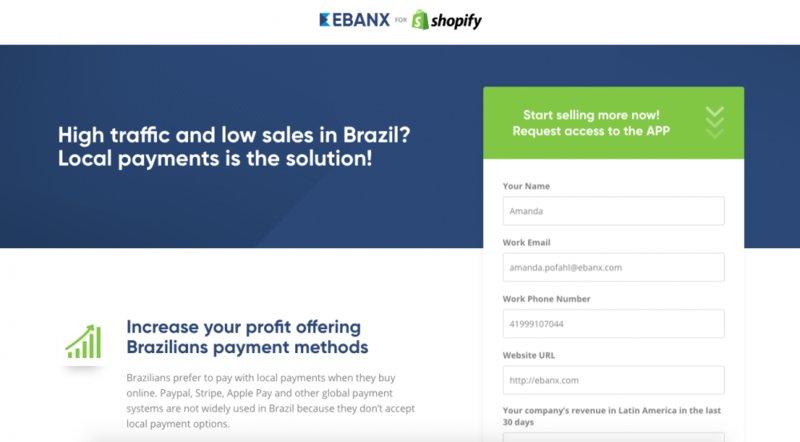 The easy way – finding a local partner: the easiest way is to find a local partner that integrates with your Shopify store and is legally allowed to deal with local payments for merchants selling cross-border to Brazil. Ready to start selling more to Brazil? 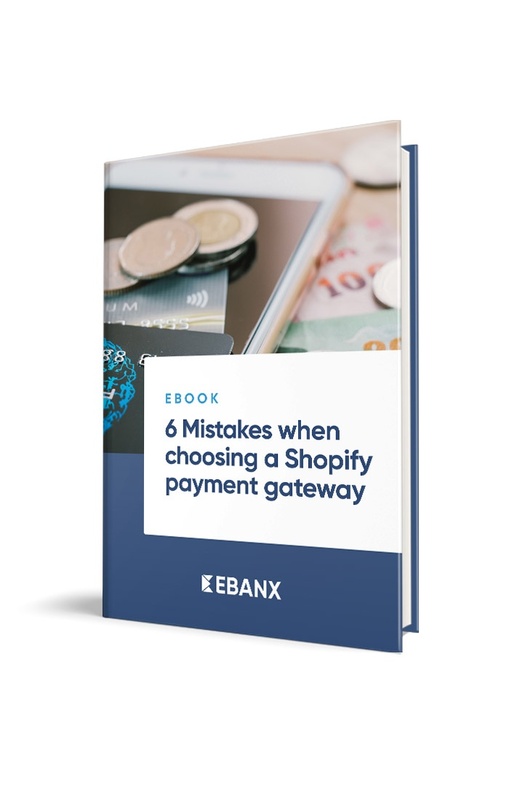 So get in touch with EBANX to talk to a business specialist that will help you conquer this booming ecommerce market with your Shopify store.